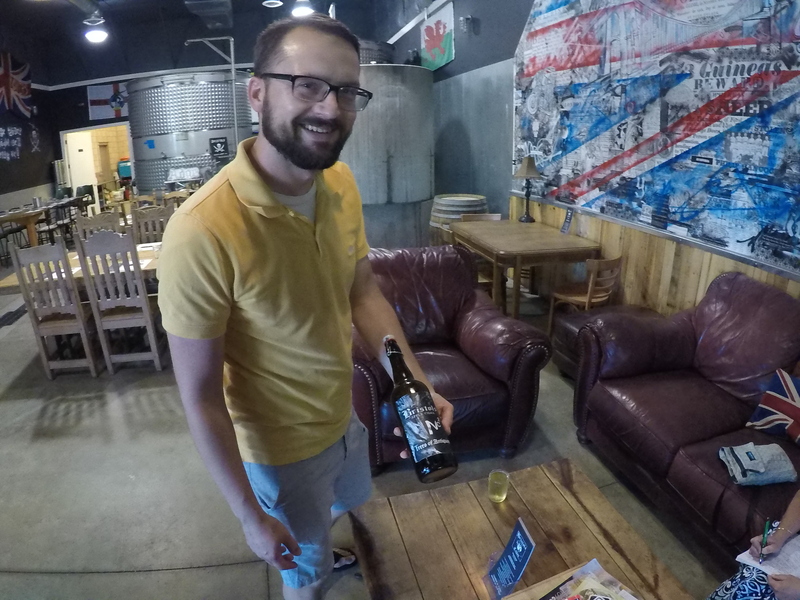 In just six steps, Bristols Cider House blends apples, artistry, and a joyful approach to life that’s captured in every hard cider they make. Bristols Cider House, where cider, fun, and friendly people converge. 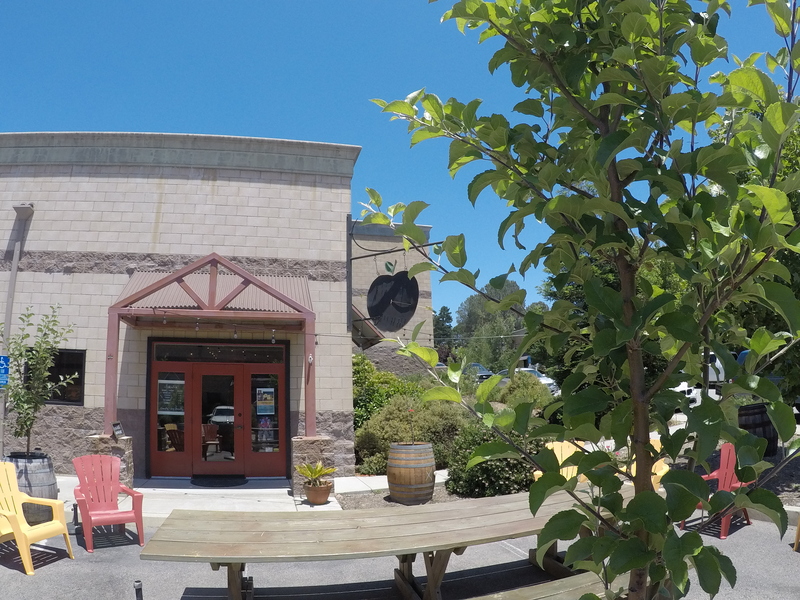 As one of the most established and respected hard cider makers on the Central Coast, this Atascadero-based producer has been creating quality ciders—and fostering a growing community of devoted fans—since 1994. With a creative approach that produces several distinctive styles and flavors—think beets co-fermented with Granny Smiths in the Mangelwurzel or Newtown Pippins and pomegranates in the Granata—as well as their beloved OG traditional hard cider, Bristols slakes cider lovers’ thirsts in a way that’s always quality, but never boring. 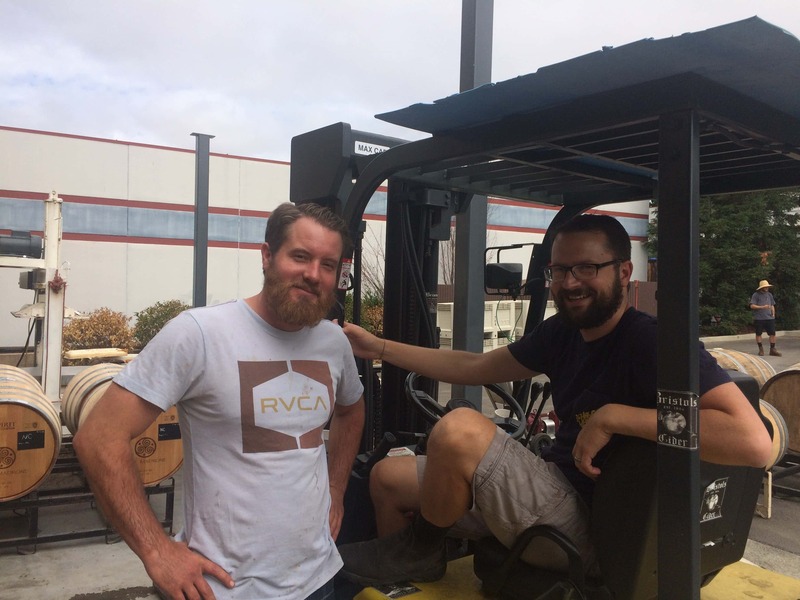 Co-cider makers Erich Fleck and Weston Hartley coax the goodness from apples to a range of creative, quality hard ciders. Co-cider makers Erich Fleck and Weston Hartley have been overseeing production at Bristols Cider House for about two years. 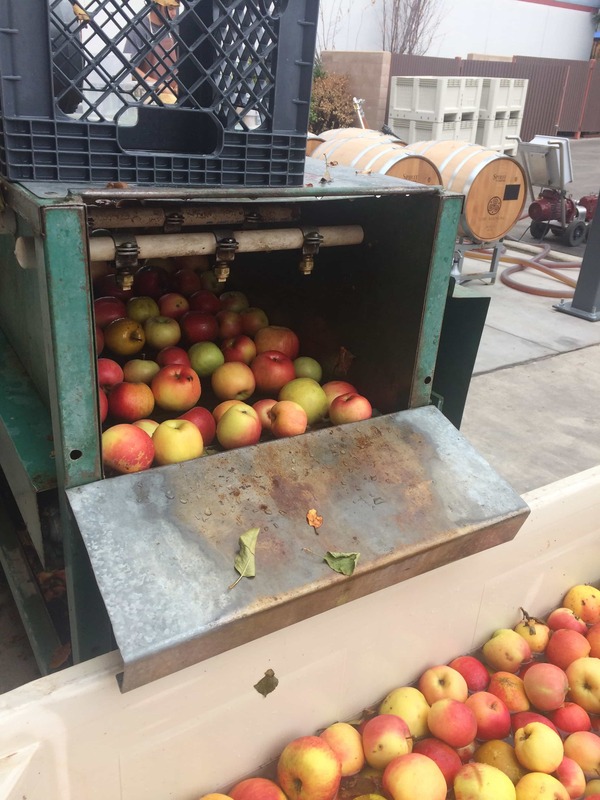 Currently, they produce about 3500 cases (12,000 gallons) of hard cider, with a rotation of more than 60 ciders and about 10 on tap or in bottles. While it’s relatively simple to make hard cider—press the juice from fresh apples, ferment it, and bottle it—creating a quality hard cider involves art, science, and instinct. Come along, fellow cider lovers, on tour of Bristols and learn how the six steps of cider making transform the humble apple into creative and inspired hard ciders just waiting for us to try. Thirsty? We are, too! Let’s get cracking. Bristols sources apples from as far north as Sonoma County and down the coast to See Canyon outside of Avila Beach in San Luis Obispo County. A few of the varieties they use are Arkansas Black, Black Twig, Braeburn, Golden Delicious, Granny Smith, Honey Crisp, and Newtown Pippins. 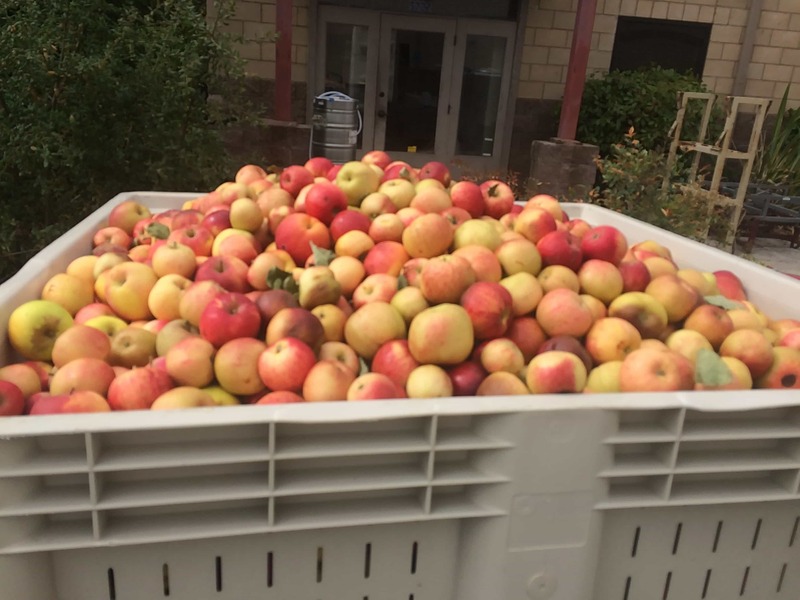 Just one of the many bins of cider apples waiting to be chopped and pressed. Different varieties ripen at different times of the year, which gives Erich an ever-changing selection of tastes to choose from depending on what he wants to showcase in a cider. Once the apples are picked, they arrive at Bristols in 850-lb. bins. On any given day, the total weight of apples arriving fluctuates between 10,000 and 20,000 pounds. Step 2: Rinse. Chop. Press. Repeat. The crush pad outside the main doors of Bristols is a busy place late June through November, when the press is going. On the day we filmed the action, the well-oiled team of Erich, Weston, and Scott would press 13,600 pounds of apples in about five hours. Apples are scooped from the bin to the washer for the next step on their cider journey. “When we’re finished, we will have about 750 gallons of juice,” said Erich. Erich picks up one bin with the forklift and brings it to two bins filled with water. By positioning the bin in the center as he raises it, he’s able to dump half the apples into each bin with water. Next, he lines up a water-filled bin in front of the press machinery and scoops crates of apples into the spray washer. As the apples make their way to the edge of the washer, Erich discards any leaves or twigs and tosses out any apples that are not worthy of becoming Bristols cider. 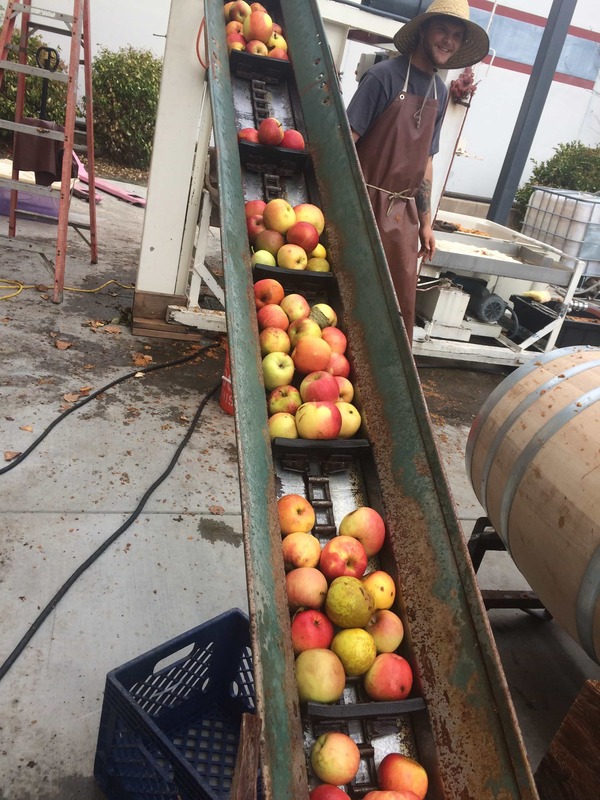 From there, the washed apples fall onto the conveyor belt and make their way up the incline to the chopper. It’s a loud, sticky affair that fills the air with the sweet smell of apples and random airborne apple pieces. Scott smartly wears a hat as he works the press with Weston. Weston pulls open the chopper chute and chunks of apple fall into the square open frame about three inches high that’s lined with cloth. He and Scott spread the apples to the top of the frame, then fold the cloth over to make a neat apple-filled package. Riding up the conveyor belt on the way to the chopper. They lift the frame, place another cloth on top, and repeat the process several times. When they have several apple packages, they pull the stack underneath the hydraulic press, which slowly crushes the apples and their juice flows into the capture tank. The juice is now ready for the magical transformation of fermentation. As the unfiltered juice is pumped into the waiting barrels, Erich monitors the fill height and pump operation. “Leaving the juice unfiltered is important because we want the fermentable juice matrix to be as raw and interesting as possible at the onset of its long journey to becoming a cider,” said Erich. Chopped apples fall to the platform below, where they’re packed into cloth-covered bundles awaiting the press. 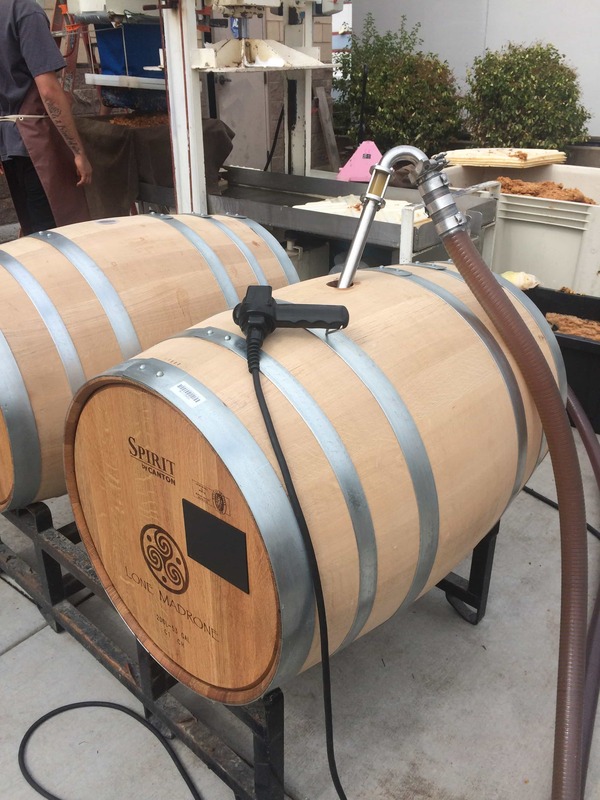 Bristols ferments in both stainless steel (including a 2,500 gallon tank) and wood, which may be new oak or neutral oak barrels, or larger 132-gallon puncheons that once held Rhone blend or Tannat wines from Tablas Creek. They also use barrels that once held spirits, such as bourbon. The fresh, pressed cider is pumped into barrels. Let the fermentation begin. On the other hand, cider is more forgiving than wine fermentation, which is focused on the chemistry. Wine needs testing throughout fermentation for alcohol level, brix (sugar), free sulpher, and acid level. While some “farmhouse”-style ciders are still and not bubbly (The Skimmington is one of Bristols’ still ciders), many ciders go through second fermentation to add carbonation. Making great hard cider is more like following an idea than following a set recipe, and the cider maker learns to bring out the best of each year’s initial fermented batches. “After fermentation, we taste the cider and then make decisions of how best to use it,” shared Erich. 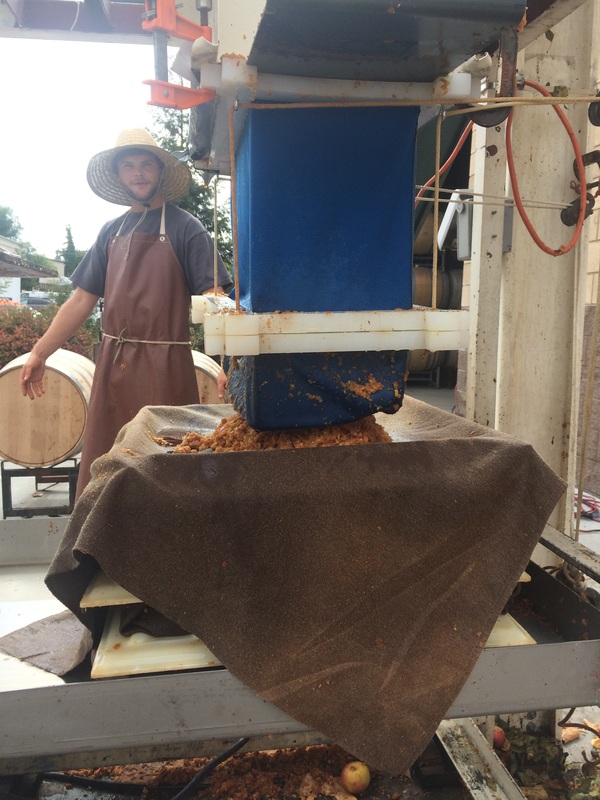 For example, the fermentation process can result in several outcomes: high pH, lower alcohol, less acid, and so on. All these variations require the cidermaker to make decisions about how to use the cider in a finished product. While hard ciders don’t have vintages like wine, which reflects the year the grapes were harvested, they can have annual variations in taste. “For example, our Barti Ddu is always made from Granny Smith apples and English hops, but it can taste different depending on the fruit each year,” said Erich. Sometimes, this can mean creating lemonade from lemons, er, a distinctive cider from interesting components. Co-cidermaker Erich Fleck with one of Bristols great hard ciders. For larger batches of blended ciders that the cider makers are happy with, they’ll use diatomaceous earth filtration as an effective way to inhibit any unwanted microbial activity before it’s bottled. The bottling process is very labor intensive, using a two-head counter-pressure bottling machine. Some ciders are bottle conditioned with added yeasts. For example, Black Bart uses saison yeast and Black Beard receives a Champagne/Brettanomyces blend. Step 6: Drink and Be Merry! Now for the fun part: enjoying the fruits of Erich and Weston’s efforts. But don’t wait too long. Bristols is known for its consistently great hard cider. But as Erich said, the consistent element is the quality, not the sameness. One of the beautiful things about Bristols is the range of ciders they make. Members of the Cider House Press Gang (Bristols’ cider club) receive three shipments per year, and one product in each shipment is made exclusively for club members. The hard ciders are the obvious reason to visit Bristols Cider House—and often. But there’s more to Bristols than the cider. The place has become a gathering spot for locals and out-of-towners who make a point to stop in on their journey. Different food options are offered during the week. 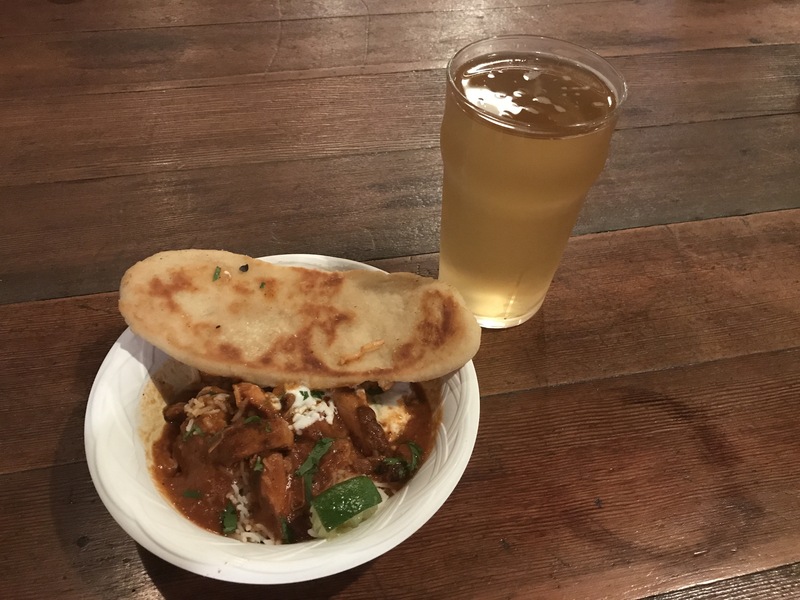 Currently, Thursday is Curry Night with Chef Jeffrey Scott, Friday is Street Taco Night from Heirloom Catering, and Saturday is Greek Night from Templeton Pizza & Greek Food. Curry Thursday is just one of the current tasty food options, plus taco Fridays and Greek Saturdays. And live music, too. There’s often live music, and no matter what, the friendly atmosphere at Bristols will soon have you relaxed and kicking back in this English pub that found a new home on the Central Coast. 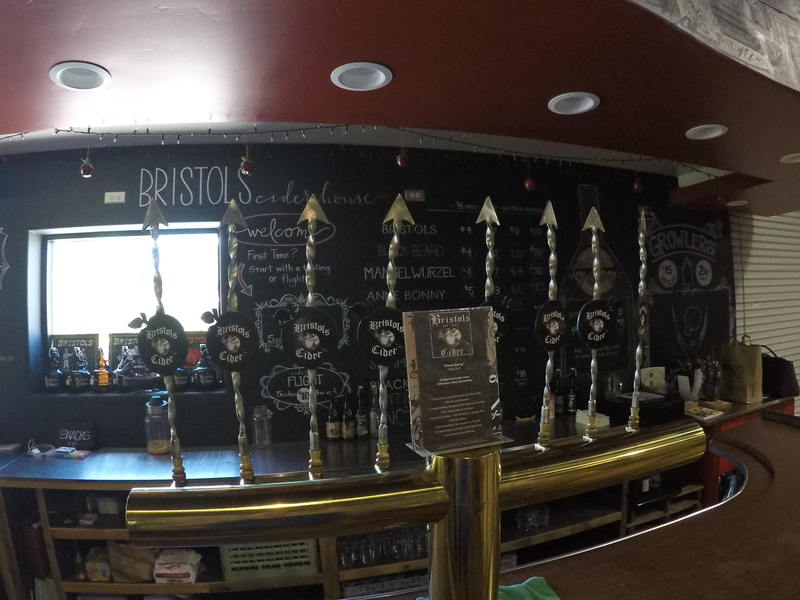 Bristols Cider House offers a wide range of hard ciders, from the traditional dry and lightly carbonated ciders to “Farmhouse” style ciders that are still, sometimes murky, and oftentimes complex. Here’s a quick look at their current offerings. Antiquity. Blend of Pink Lady, Golden Delicious, New Town Pippins. Fermented and aged in new whisky barrels. Bristols Original (The OG). A fresh and classically styled English dry cider. Bristols Skimmington. A still farmhouse scrumpy with Brettanomyces yeast. Skimmington is murky and still, rather than carbonated. The Brett brings out a sweet, yeasty flavor and aroma. Bristols Granata. Named after the Latin word for pomegranate, this pretty pink and tart cider blends Newtown Pippin and pomegranate ciders. The Granata is a lovely garnet-hued cider that has a bit of a bite. Bristols Barti Ddu. It’s a 100% Granny Smith apple cider that is dry hopped using English hops. Even if you don’t like hoppy cider, try this one. It just may change your mind. Bristols Black Beard. This cider, from a variety of applies like Arkansas Black, Black Twig, Honey Crisp, and Newtown Pippen, is aged 18 months in bourbon barrels. The result is the masculine side of bourbon (not the sweet vanilla side), and is slightly yeasty and definitely complex.